I confess, I love it when new discoveries meet my bias. I created the Page – Do you know the dangers of too much sitting? nine months ago. What follows is the latest information on prolonged sitting from the American Cancer Society (ACS). A new ACS study links prolonged sitting time with a higher risk of death from all causes, including 14 of 22 measured causes of death and 8 of the 10 most common causes of death. The link existed even after adjusting for levels of moderate-vigorous intensity physical activity. The study appears early online in the American Journal of Epidemiology. I love this post! I hope you will read it and learn from it too. The more I read and write about health and fitness, the more I appreciate that ‘little things mean a lot.’ Little things like stretching, getting a good night’s sleep and walking, not living a sedentary lifestyle. These are elements that can keep you in tip top shape, mentally and physically for years to come. This article was first published in The Hindu on 2nd October 2010. I see people completing their workout routines and rushing through a few cursory stretches; mainly to appease the trainer, mind elsewhere, in a hurry to get going. Their flexibility does not get any better; they can still barely bend forward to reach for their thighs leave alone their toes, but they see no reason to waste time toiling with “stretches’. They have more important things to do, their cardio, so they can burn an indecent number of calories, push as much weight as they can to gain that well sculpted physique. Flexibility? Yes, well, let’s be done with it as quickly as possible! One couldn’t be more mistaken. An inflexible muscle is more prone to injury and cannot perform as well as it should. Good quality muscle is supple, strong AND flexible. I confess that only last year I was ignorant of the fact that sitting for a prolonged period was very hazardous to your health. Since then, I have erased much of my ignorance with a number of posts. You can check them out on my Page – Do you know the dangers of too much sitting? So I was gratified to read the latest info on sitting from the Harvard Medical School. “Can an hour of brisk walking counteract the downsides of sitting for most of the day? Maybe, according to a study published online July 27, 2016, by The Lancet. Since biking is one the of the suggested exercises, I thought I would include this shot of Gabi and me riding in Chicago’s annual Bike the Drive on famed Lake Shore Drive. There are a lot of aspects to living a healthy life besides just getting your weight down to what it should be. Here is a nice informative infographic with very useful suggestions. Regarding the second point – Sitting down all day, I have a Page on The Dangers of Too Much Sitting. Check it out for more info. You can also look into my Page – How Important is a Good Night’s Sleep? I also have a Page on the tenth point – Smoking. Check out – How Many Ways Does Smoking Harm You? I learned about the dangers of prolonged sitting a while back and have posted several times on it as well as created a Page – Do You Know the Dangers of Too Much Sitting? which you can check out at your leisure to learn more about this fascinating subject. I was interested to see that prolonged standing is also a no-no. It seems our bodies were created to move and that is all there is to it. 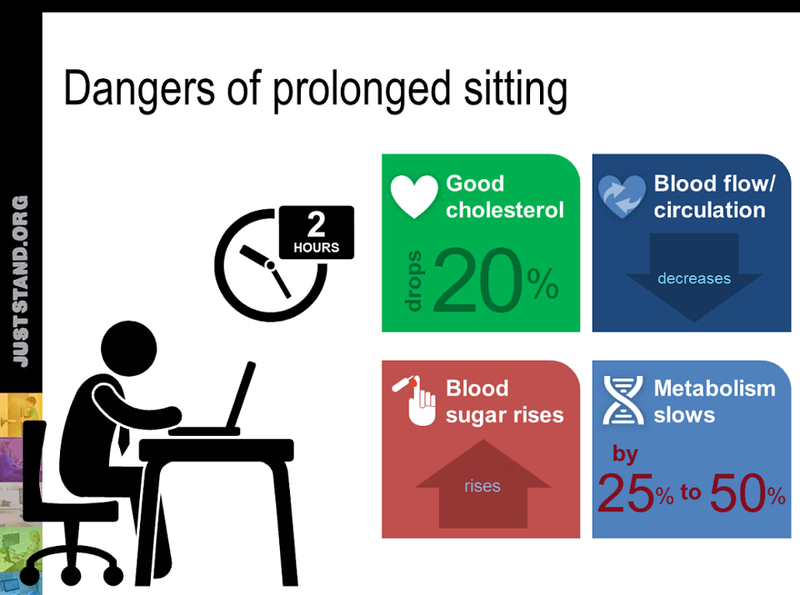 While the danger of prolonged sitting may seem too subtle for some to take very seriously, I think it is very worthwhile information. So many people feel they suffer from mysterious maladies. This is clear cut science that removes a layer of the mystery from some of those maladies. I am thrilled that my Apple Watch reminds me every hour with a Time to Stand reminder. You can achieve the same thing with a timer at your desk. (I put together a page on How My Apple Watch is Good for Your Health) with lots more aspects of healthy living. The Journal also mentioned wearing a headset and walking in the office while talking on the phone rather than just sitting at your desk. Likewise, small meetings can be held while walking rather than cooped up in an office. Clearly folks with desk jobs have some thinking to do on the subject. I am now in my sixth year of writing this blog. It started out as a weight loss guide, but over the years has morphed into a full service mental and physical health project. Weight loss isn’t off the table; it is just a byproduct of keeping oneself in tiptop health. That little bit of history was because of a recent publication from Tufts University. 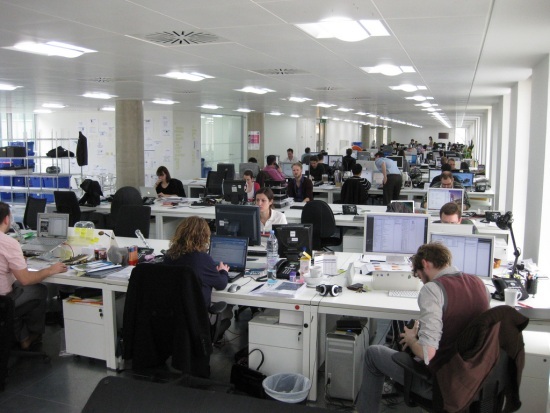 “Multiple studies have warned about the health risks of sitting too much. Hours spent sitting, whether at desks or in front of the television, have been linked to increased odds of cardiovascular disease, type 2 diabetes and kidney problems. But modern life can make it difficult to stay out of chairs, and alternatives such as “standing desks” don’t appeal to everyone. “A new study may offer hope to sedentary sitters: Using data on more than 3,600 adults, researchers found that brief periods of simply walking around the room substantially reduced mortality risk among people who spent long periods sitting. As little as two minutes of gentle walking per hour was associated with a 33% lower risk compared to non-stop sitting. MEASURING MOVEMENT: In the study, published in the Clinical Journal of the American Society of Nephrology, Srinivasan Beddhu, MD, of the University of Utah, and colleagues analyzed data from the annual National Health and Nutrition Examination Survey (NHANES). In recent surveys, selected participants have supplemented their questionnaire answers by wearing activity monitors called accelerometers; this gives a more accurate record of a person’s movements than depending on individual recall. Most of the participants were generally healthy, although a subgroup of 383 people had chronic kidney disease. Researchers divided participants into four groups based on minutes per hour of different levels of accelerometer activity: sedentary/sitting, low (such as standing up but not walking around much), light (such as strolling around a room or walking into another room), and moderate/vigorous (jogging or other exercise). The study then compared activity levels to records of deaths three or four years after the assessment. ADDITIVE ACTIVITY: There was little difference in mortality between the sedentary and low-activity groups. But people who interrupted their sitting with light activity were at significantly lower mortality risk than those who were completely sedentary; this difference was even sharper among the kidney-disease subgroup (41%). As little as two minutes an hour of light activity was enough to be associated with lower risk. “Boosting activity levels to moderate/vigorous further reduced risk, but the number of such active participants was too low to be statistically significant. Adding additional minutes of light activity, however, did make a significant difference. Getting up from your chair for two minutes or five minutes more light activity rather than sitting time, Dr. Beddhu said, could further reduce risk of premature death. He cautioned that the study was observational, and so can’t prove cause and effect. And Tufts’ Nelson notes that a quick break from your chair is no substitute for regular physical activity. But if you’ve been worried about the health risks of sitting too much, apparently every little bit helps.